Learn to choose interventions based on the client's developmental stage!Teenagers are often a strain on families, and they can pose difficulties even in a family therapy setting. Developmental-Systemic Family Therapy with Adolescents integrates research and theory about adolescent development with different approaches to family therapy. By matching the adolescent client's developmental stage and particular issues with the most effective therapeutic approach, this book enables family therapists to tailor their treatment plan to meet each family's unique needs. 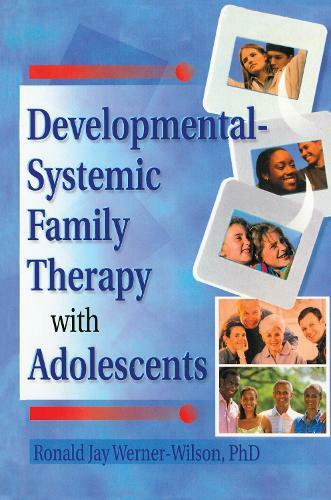 Developmental-Systemic Family Therapy with Adolescents contains special chapters on such serious teen problems as suicide and alcohol/substance abuse, as well as thoughtful consideration of such normal issues of development as cognitive stages, identity development, and self-esteem. Interpersonal relationships are also considered, including parenting, peers, and attachment issues. This essential resource offers family therapists suggestions on how to make sessions more relevant to clients who engage in risky sexual behavior, abuse alcohol and drugs, or run away from home.Each chapter includes detailed, down-to-earth discussions of:case examples common presenting problems assessment and treatment issues therapy process dynamics suggestions for developmentally appropriate interventions Developmental-Systemic Family Therapy with Adolescents examines emotional and cognitive development in adolescents to help therapists improve communication and devise effective methods of treatment. Its well-balanced, pragmatic approach to therapy will help you properly assess your clients and offer them the services they need in a form they can accept.